Hurricane battered Punta Gorda was the location for the Development Coach Workshop that was held at Seminole Lakes Country Club on October 30th. Seminole Lakes C.C. 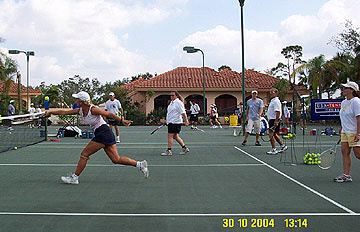 was one of the least damaged tennis facilities in Charlotte County after Hurricane Charley swept through the area. The workshop was scheduled for September 11th but Hurricane Ivan's impending arrival required that the event be postponed. None of these challenges dampened the enthusiasm of the 36 P.E. Teachers, Parks and Recreation staff, CTA instructors, Pros and Players from attending the workshop and enjoying a fun filled day of learning the latest teaching techniques from National Development Coach Workshop Trainer, Jeff Davis. 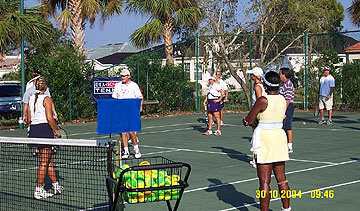 Lee County Community Tennis Association and Charlotte County Community Tennis Association hosted the event. "The newly acquired skills, motivation, and enthusiasm that the coaches left with on Saturday afternoon will make it possible for them to deliver quality tennis programs in our area. 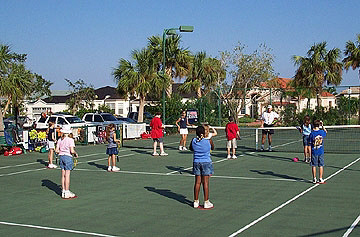 I am extremely excited about all of the new faces I see getting involved with tennis in our area," said USA Tennis Florida Community Coordinator, Susie Bessire. Ten children from the Charlotte County Community Christian School also attended the workshop for one hour of on-court instruction with "Coach Jeff." These children had little or no tennis experience and their presence added a new and exciting dimension to the Development Coach Workshop. The adults were able to actually see a highly skilled coach work with a large group of beginner children. 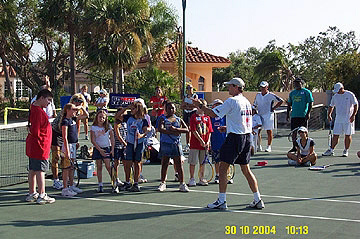 USA Tennis Florida Vice-President elect, Donn Davis said, "It was so good to actually watch a Pro work with a group of kids and get results!" The children were treated to lunch and all went home with a USA Tennis Florida goody bag. It was a great learning experience for both the adults and the children. We are ready to hit some ball Coach!! Pass me if you can!